''Sand In My Shoes'' is a classic beach cottage perched on a lush, secluded corner lot in Grove By The Sea. From the wrap-around front porch you pass through a wide foyer into the double height great room surrounded by plantation shuttered windows. The bright first floor includes a guest room with porch access, a full bath, dining room, laundry room & galley kitchen with granite counters & stainless steel appliances; hardwood floors abound. The second floor is devoted solely to the spacious owner's suite. The two-bedroom, two-bath main house is made more accommodating by the owner built en-suite guest apartment over the cottage's separate garage. 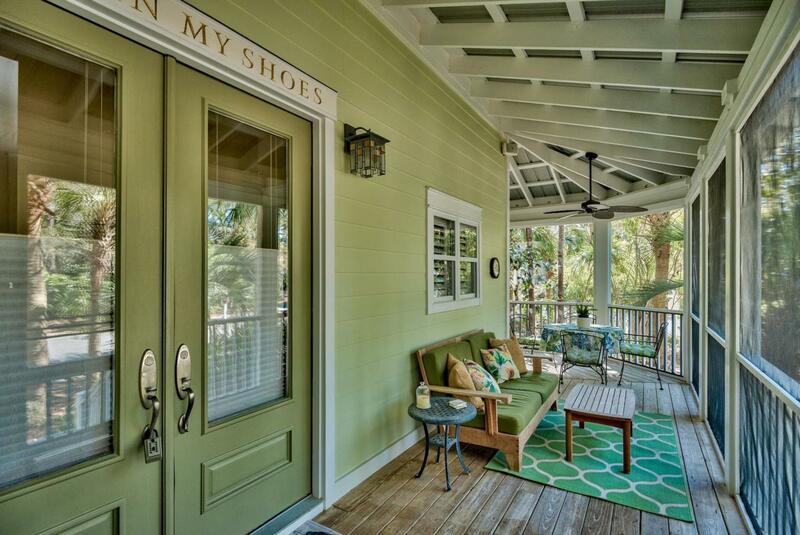 Sun-filled living extends into the backyard with a large porch & convenient kitchen access. Steps from the beach! Fully furnished & rental ready!The garage and carriage house apartment above it were added in 2012. Additional upgrades by the current owners include new HVAC units (installed 2013), new water heater, new windows (excluding the high ones in tower), spray-in insulation, and the outdoor gas grill. Grove by the Sea offers guests 2 swimming pools, tennis courts and is within walking distance to both Seaside and WaterColor.